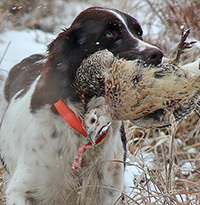 Hunting is John’s passion and his dogs will make any trip you plan more productive. Our Small Munsterlanders hunt upland birds, waterfowl and rabbits. Available for half day or full day local hunting and longer trips out of state. Packages available to include dogs and/or meals. Please call for more information and prices.